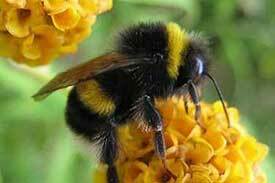 Bumblebees are very important pollinators that are large, fuzzy insects with short, stubby wings. While other animals pollinate, bumblebees are particularly good at it. Their wings beat 130 times or more per second and the beating combined with their large bodies vibrates flowers until they release pollen, which is called buzz pollination. Buzz pollination helps plants produce more fruit. Bumblebees are an excellent alternative to honey bees and are a supplemental source for pollination of many crops. There are several attributes of bumblebees that promote their use as pollinators. Some bumblebees have long tongues, Ttese long tongues give bumblebees an advantage over short-tongued bees like the honey bee when foraging on flowers with long tubes, such as red clover. Not surprisingly, the petals of bumblebee flowers often form elegant, elongated bells, funnels, or tubes, with the nectaries hidden deep inside. In some Springecies, the nectar is hidden at the end of a long, hollow floral structure called a Springur. In these ways, the plants make sure that the precious liquid gets only to the bumblebee, the animal most capable of accomplishing pollination. Bumblebees have been shown to fly in cooler temperatures and lower light levels than many other bees, extending their work day and improving pollination of crops facing inclement weather. Bees can’t see the color red, and to them it looks much like the surrounding green foliage. However, they are highly attracted to shades of purple, blue and yellow. Plants with flat, single blossoms are easiest for the bees to access. Although double blooms are beautiful, bees have difficulty reaching the nectar inside the flowers.